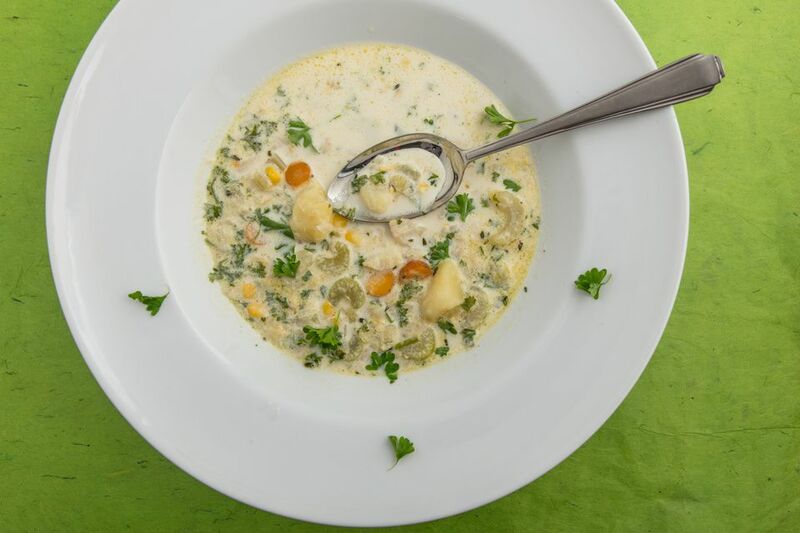 This classic New England-style fish chowder is hearty and satisfying. It's often made with haddock, but nearly any lean white fish, like cod or halibut, will work equally well. Here's an easy recipe for making fish stock, which is the base for the chowder and what provides much of the flavor. You can make it using the bones from the fish you got for the chowder, or you can sometimes buy fresh fish bones from your fishmonger. It's definitely worth the additional steps. As for the potatoes, red potatoes add color to what would otherwise be a mostly monochromatic soup. But you can use any waxy potato, like white potatoes, or Yukon golds or even fingerling potatoes. Stay away from starchy varieties like Idaho potatoes (aka Russets), though. They tend to fall apart when they're simmered, so they won't work as well. Cut the salt pork or bacon into about 1/4-inch cubes. This may be easier if you let it sit in the freezer for a few minutes before dicing it. Reduce heat to lowest setting and carefully stir in the fish. Heat very gently for about 5 minutes or until the fish is fully cooked. Don't let it boil. Season to taste with Kosher salt and white pepper, stir in the parsley and serve right away.